Apparently in 1974 a silly frenchman named Philippe Petit snuck onto the unfinished rooves (that's plural for roof, right?) 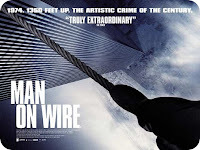 of the Twin Towers, strung a rope between them, and did a highwire dance between the two for almost an hour before NYC's finest hauled him off to jail. Man On Wire tells Philippe's story about the historic crossing. In his own words. His girlfriend's words. And his cohorts' words. There are plenty of interviews, pictures, and lots of video footage. I kept thinking, "This is impossible. He'll never do it." But it wasn't. And he did. The tale unwinded gracefully. Very good pacing. It kept teasing the viewer with the knowledge of what was coming, inching slowly toward that final journey. Great direction. Not too much interviewing. Not too many odd, confusing flashbacks. Phenominal dialog. All of Philippe's pieces were great. He's a gifted artist on many levels. I loved listening to his recounting of the adventure. And all around good writing. I can see why it made no splash at the theaters. Probably not a date movie. Would definitely bore the kids these days. But, I'd be surprised if it wasn't nominated for some awards as a documentary. For somebody with an interest in odd snippets of history, it is worth the rental.